What is mentoring? In the traditional sense of the word, mentoring is when one offers wisdom, knowledge, experience or advice to others to help them progress in their career and life. Typically, in businesses that offer mentoring programs, the Mentor is someone with more tenure and experience. That person is paired with a Mentee, someone who is more junior in experience or is a newer colleague. The assumption in this model is that mentoring works one way, and in this case, it is “top down”. However, truly progressive organizations have gone back to the origins of mentoring and the traditional description above. 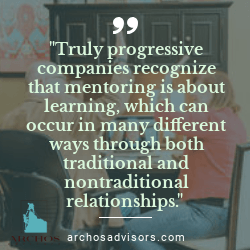 These companies recognize that mentoring is about learning, and learning can occur in many different ways through both traditional and nontraditional relationships. Two such examples of these nontraditional relationships are: reverse mentoring and reciprocal mentoring. In reverse mentoring, a more senior, experienced professional is paired with a colleague that may vary in experience, background or perspective. The roles are switched here, so the senior professional becomes the Mentee and the other professional facilitates agenda topics and meeting dialogue as the Mentor. In reciprocal mentoring, the pairing portion is the same; however, each professional in the pair takes turns playing the Mentor role. Leadership Development – The more experienced professional learns to be more open and gain perspective from others with diverse experiences and backgrounds, and their partner has an opportunity to lead and grow by facilitating the dialogue. Open Communication – The nontraditional relationships openly support and reinforce two-way communication and sharing. This arrangement can help bridge the generational gap and promote a greater understanding of the needs surrounding diversity and inclusion. Technology and Innovation Advances – It is no secret that the younger generations will be the most tech-savvy employees in the company. These nontraditional relationships can help transfer the knowledge of new technologies and their applications as well as open up conversations that can lead to more innovative ideas and processes. Employee Engagement – By flipping the roles, the Mentees turned Mentors often find a greater sense of purpose in their individual contributions. This helps drive their engagement and psychological commitment to the company. A Learning Culture – As stated, these models are all about learning. By establishing mentoring relationships of all kinds, the organization demonstrates the value placed on learning in the environment. For You – Take a fresh look at your Mentors. Consider how you gain the greatest perspective and knowledge, and the relationships you need to develop as a leader. What nontraditional relationships might help you? For Your Organization – Challenge assumptions. Consider what is possible and what is needed. 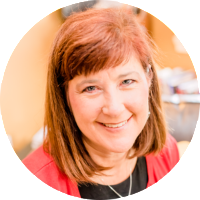 Could a nontraditional model strengthen your mentoring approach? By taking a step back to contemplate your approach and ask these questions, you’ll be able to identify the strengths and opportunities for improvement. Most importantly, you will be equipped to make changes to achieve the greatest impact for you and your organization. Older PostWho is Your Talent Architect?